Welcome to our Website! We bring a deep appreciation of Sonoma County’s lifestyle and landscape to the business of real estate. For more than 15 years, we've successfully navigated through the ups and downs, short sales and bubbles. Our motto is "Success equals preparedness plus opportunity!" 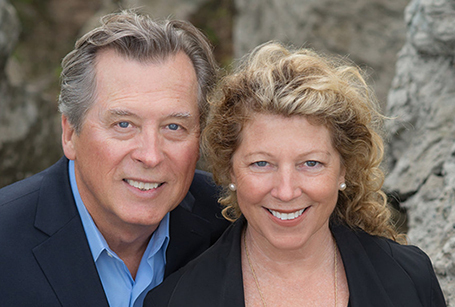 Russ and Sandra are both licensed Realtors, focused on representing clients in the purchase and sale of residential, commercial, investment, ranches, land and vineyard property within Sonoma County. Russ and Sandra truly love this area and offer a wealth of knowledge of current transactions, neighborhood information, local climate zones, schools, and all real estate related services, including mortgage, insurance, and inspection information. Russ and Sandra are expert negotiators. They help you work every angle to your advantage with grace and class by being open, knowledgeable and prepared. They work diligently to satisfy your needs. If they need to be in the office or the field for you, they will be there; and gladly! As a team, they are more than one Realtor doubled. One or both of them will be with you at every milestone and important event in the process. Russ and Sandra truly can be in two places at one time! Russ has a rich and varied background in construction and thus can guide you through all of the showings and inspections. Russ has a world of knowledge regarding the infrastructure of a building and the lay of the land. Sandra has years of experience with contracts; nothing gets by her. She will help you understand all of the contract documents presented to you and written for you. Sandra is a Broker now and has additional resources through her Eco-Green certification. Russ and Sandra are customer driven, dedicated to achieving results and providing exceptional service. When Russ and Sandra list your property, expect only the best marketing, with impeccable staging, stunning professional photography, full internet exposure and open houses. If you are in the market to buy or sell a home, Russ and Sandra will put their real estate expertise to work for you!